Salami is a cured sausage often used as a luncheon meat on sandwiches or added to cooked dishes such as pizza. Whether you purchase whole, hard salami or pre-sliced salami, once the whole salami is sliced or the package is opened, the salami becomes a target for bacteria. Food-borne bacteria can cause food poisoning, so proper handling of the sliced meat is vital to your health. Even if bacteria aren't present, the flavor of the salami declines once the package is opened. Leave the salami in the original packaging until you are ready to use all or some of it. Place it in the refrigerator. Wrap opened packages of salami loosely in wax paper. 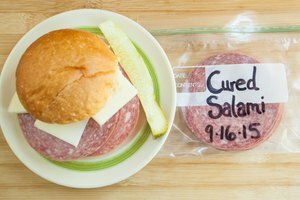 Tape the wax paper closed or place the wrapped salami in a plastic food storage container. Store the luncheon-meat-style salami in the refrigerator for three to five days. Store sliced hard salami in the fridge for up to two weeks. Freeze sliced hard salami for longer storage. 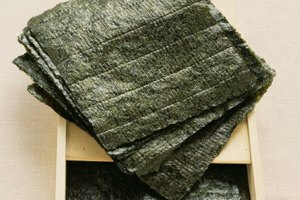 Wrap in plastic wrap or place in a food storage container. The salami will keep for up to six months in the freezer. 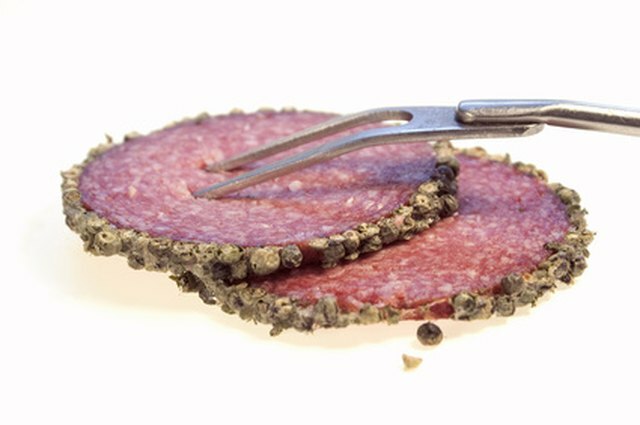 Salami sold as pre-sliced luncheon meat often has more moisture in it than a hard salami, which shortens the length of time it can be safely stored. An unwrapped, unsliced log of dry salami can be kept at room temperature for up to six weeks or refrigerated safely for up to six months. 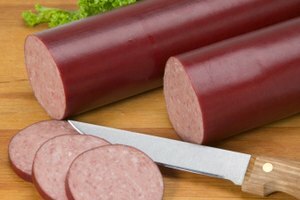 Always dispose of salami and other sausages if they have any visible mold growth, are discolored or produce an off odor.